Naqshbandiya Foundation for Islamic Education: What is Naqshbandiyya Sufi Order? What is the Naqshbandiyya Sufi Order? By the 10th Century, Sufi's were expected to have recognized spiritual genealogies in the form of continuous chains of Sufis going back to the Prophet (saws) himself and in the 13th Century International Islamic Sufi groups named after founder-figures had developed, for example, Qadiriyya, the Suharawardiyya, the Chistiyya, and the Naqshbandiyya. 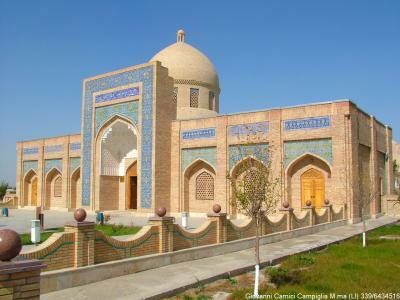 The Naqshbandi tariqa is a pan-Islamic Sufi lineage of Central Asian lineage, named after Bahauddin Naqshband (d. 1389) (rahmat Allah alayhi), who is buried near Bukhara in present day Uzbekistan. Historically, the Naqshbandiyya can be divided into three stages, each of which is distinguished by a pivotal charismatic figure who developed new spiritual practices and even redefined the identity of the Sufi group. The first stage, called "the way of the masters" since the time of Khwaja 'Abdulkhaliq Ghujduwani (d. 1179), originated with the Prophet (saws) and Abu Bakr as-Siddiq (radiya Allahu anhu). Bahauddin Naqshband (rahmat Allah alayhi), the founder figure, initiates the second historical stage when the spiritual path was called the Naqshbandiyya. The third historical stage of the Naqshbandiyya begins with Shaykh Ahmed Sirhindi (d. 1624) (rahmat Allah alayhi). Also called the renewer of the second millennium (mujaddid-i alf-I thani), he represents the most famous of Shaykh Baqibillah's (rahmat Allah alayhi) disciples who redefined Tassawuf's role in the society with the goal of following in the footsteps of the Prophet (saws). Perfect performance of the Islamic religious legal requirements and emulation of Prophetic behavior became the Naqshbandi touchstone of legitimacy for a person who had returned from the spiritual heights/depths. The conscious modeling of one's inward and outward behavior on that of the Prophet (saws), the inner and outer sunna, became the norm for Naqshbandis. According to Sirhindi (rahmat Allah alayhi), no Muslim can become a protege of God (waliullah) unless he follows the Prophetic example because of the preference of the Prophet (saws) himself who has reached a spiritual level that no other prophet reached. Tariqa is not something separate from sharia but it is one dimension and its "servant." Shaykh Ahmad Sirhindi Imam Rabbani (rahmat Allah alayhi) said in one of his celebrated letters (maktubat) "The Sharia consists of three parts, knowledge (ilm), deeds (amal), and sincerity (ikhlas)." Until all three are present and realized, sharia cannot be said to be fulfilled. When sharia is fulfilled the pleasure of God Almighty and Exalted results. This is superior to all forms of happiness to be found in this word and in the hereafter. The Sharia is the guarantor of all happiness both in this world and the hereafter. There is no human concern for which he has needs anything beyond Sharia. So Sharia is all inclusive and all-sufficient. The Tariqa by means of which the Sufis are distinguished from the rest of the community is the servant of Sharia, has the function of perfecting its third component, sincerity (ikhlas). From India the Naqshbandiyya-Mujaddidiyya often spread to numerous parts of the Islamic world by way of Mecca and Medina. Maulana Khalid Baghdadi (rahmat Allah alayhi), after obtaining his initiation in the Naqshbandiyya in India, traveled to the Middle East and established a whole network of successors throughout the region, including Kurdistan, Daghistan, and Anatolia. Shaykh Shamil who led the resistance to the Russians in the North Caucasus for an extremely long period was in the Khalidi sublineage of the Naqshbandiyya.